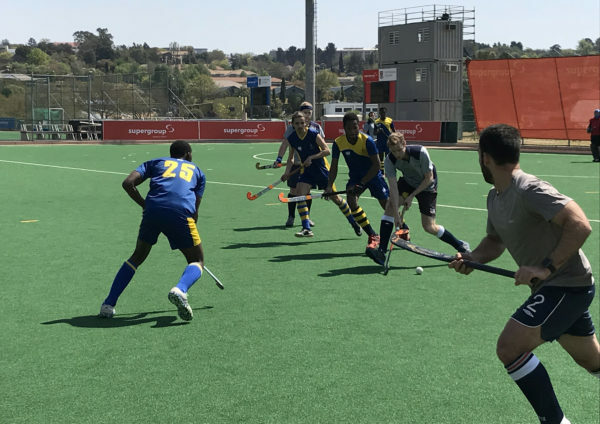 Wits men’s hockey C defended their spot in the Southern Gauteng hockey Winter league against the Crusaders and secured a 6-1 victory on Sunday, September 2. The team of young boys gave the elderly Crusaders players a hard time in the Saint Stithians field, dominating the match with two goals in the first half and four more in the second half. Wits men dominated the game with a leading goal by Charles Makhombe which was scored in less than 15 minutes of the first half. This was followed by another goal by Kyle Rau shortly before half time. The Crusaders felt the pressure and pumped up enough stamina to score a goal at the start of the second half. This victory was short lived as Thabo Mofokeng scored the third goal for Wits. “The game wasn’t as competitive as it normally would’ve been because of the old people we played against but I thought our boys did well as a team. We could’ve done a lot better but we did do well in our performance at the end of the day,” said Mofokeng. The fairly new Wits men’s hockey C group have moved up to the fourth position on the winter league log and show significant improvement. This is a serious milestone given that the boys experienced some serious hardships in the previous seasons. Although the scoreline was in Wits men’s favour, the team captain, James Channon, is optimistic for the next season. “This is our second last game of the season and we only have one more game to improve, we need to build for next season and luckily we have Wits Summer League that’s all the way through November,” he said. Wits Vuvuzela, Wits knocked out of Varsity Hockey tournament, May, 2018. Wits Vuvuzela, Former Wits Hockey coach appointed to national team, February, 2018.